It was a busy weekend at LDC recently when we had Smart Graphics on site fitting vinyls. SPAR is principal sponsors for the forthcoming indoor European Athletics Championships that take place in Glasgow later this year. The event that welcomes over 500 athletes from a host of countries will take place at the Emirates Arena, Glasgow from 1st to 3rd March 2019. 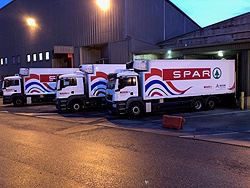 To support the event SPAR Scotland has lots going on over the new few weeks. The branding is fitted to 20 of our lorries and we’re really pleased with it. This is a sneak peek at what it’s like. Watch out for them out on the road now!